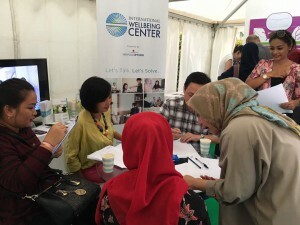 May 2017-Having the same mission and vision to support your lives with complete wellbeing, Integra and International Wellbeing Center (IWC) are working together in a partnership. Integra is the nation’s largest employee welfare benefits provider. On May 18th 2017, IWC supported the launching of Integra’s ForLife portal, the first holistic wellness online store that focuses on mind, body and soul. ForLife is a one stop shop for healthy living, and customers can purchase a variety of product deals such as insurance, medical services, healthy food, sport equipment, mental health services, health education and relaxation (spa and massage). You can find IWC services in ForLife, we offer group workshops for professionals, parents and health workers. For professionals or anyone who needs help in sleep management, we have “Brain-Hacking Your Productivity with Yoga Nidra”. In this workshop, you will learn how to power nap effectively to replace your lost in relaxed sleep. For parents and health professionals, we have “How to Teach Fun Yoga for Special Needs Children. Lastly, we also want to support parents with more skill through “Parents and Kids Bonding with Yoga Story Telling”. During the event, IWC’s booth got a lot of visitors’ attention as our counsellors gave personality and relationship tests to try. People were welcome to sit and talked to our counsellors to discuss their issues while enjoying our healthy infuse water drink which was prepared by our wellness coaches. IWC is your professional support for your complete wellbeing.